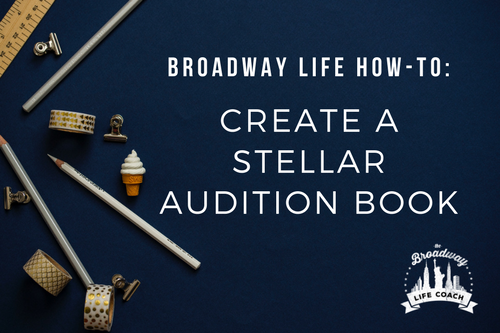 Perhaps the most valuable and necessary tool for a soon-to-be Broadway performer is your audition book. This book is something you will lug around EVERYWHERE, and since it’s a shared item with every pianist that you meet in the room, it becomes a reflection of your preparedness. Obviously, you want to represent yourself well, so an organized, neat book is a must. Luckily, it’s super simple to set up. Here is my checklist for creating an audition book that will help you shine at your next audition. 1) BUST OUT THE SCHOOL SUPPLIES. Purchase a 3-ring binder that ideally has pockets inside and is no bigger than 2 inches. Any larger than that and the binder becomes too large for the pianist to even handle. Make sure the 3 rings close well and don’t separate; this becomes cumbersome for page turns. Most importantly, only include the songs you know you’ll sing. You can create a separate binder for vocal coaching and lessons. 2) GO A LITTLE PLAIN JANE. Your audition book is not the place to go wild. Keep the color of the binder simple and neutral, so no one is distracted by it. Busy patterns and silly prints can also make you look unprofessional. Keep the focus on you and your gorgeous outfit instead. 3) YOU NEED SHEET PROTECTORS IN YOUR LIFE! Buy them, buy them, buy them. You’ll be so glad you did. Be sure to purchase them in matte, not gloss; you don’t want a glare to interrupt the pianist. Keeping them happy gives you an ally in the room. If you have paper falling out of your binder or pages hanging off the rings, you are setting yourself up for a bad first impression. This is generally Musical Theatre songs pre-1960. This is generally Musical theatre songs post-1960. Sometimes, these can be a musical theatre song, but generally you want to find something from the Billboard charts. 5) CLEARLY MARK YOUR MUSIC. I suggest you know the full song, but be familiar with 8, 16, 32 bar cuts within the music. If you ARE doing cuts, make sure it’s clear where the pianist should start and finish. Using Post-It notes is a great (and temporary) way of marking these cuts. If you haven’t figured out the cuts yet, get together with a vocal coach, discuss where you want them to be within your songs (HINT: They usually aren’t the first 16 bars of the song.) This way, you can make sure the music is easy for a pianist to read and understand. Your audition book is like a portable filing cabinet, so you want to keep it tidy and easy to find things. Either put your songs in alphabetically or create a table of contents, so that you can to turn to the correct music quickly. Another idea is to add tabs on the music with the titles. Audition time is precious time, and the more organized you are, the more gracious the energy. 7) KEEP AN EXTRA HEADSHOT AND RESUME HANDY. Pack an extra headshot and resume in your binder. You never know when you’ll leave the house and accidentally forget them. It happens to the best of us, so keep an extra copy with you to stay prepared and ready. So many things within this business are beyond our control as performers that it’s important that we cling to things we CAN control. Your audition book is one area where you can set yourself up for success. And since it’s an everyday tool, it can easily be overlooked. So get ahead of the pack by planning ahead and saving yourself the stress, so you can concentrate on being your best in the audition room.